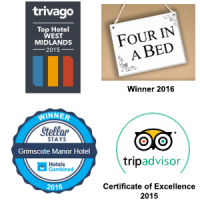 We aim to cater for the needs of all visitors at Grimscote Manor Hotel, Coleshill. The following statement is a summary of the facilities and local amenities available. If you have any specific questions, queries please feel free to call and we will endeavour to help. Grimscote Manor Hotel can be contacted by phone 01675 464222, weddings 01675 464000, fax 01675 462134 or email info@grimscotemanor.co.uk There is also a website for the hotel www.grimscotemanor.co.uk. The hotel is set within its own grounds of 4 acres, so therefore there is plenty of parking. The nearest railway stations are Coleshill parkway (1mile) water Orton (2miles) Birmingham International (4miles). All stations have taxi ranks or taxi phones outside. We have a list of local taxi companies at reception. Public transport buses run every 30 minutes with a 5 minute walk to the bus stop from the Hotel. The hotel will and can cater for any special dietary conditions if pre-booked. to Friday and 8.00am to 11pm Saturday and Sunday. If arriving after 11pm, please can you notify the hotel, so we can make arrangements for check in? The car park is situated at the front of the hotel. Assistance can be provided with luggage, if a ground floor room is required or special diets, this must be pre-arranged on booking. The hotel has eighty car park spaces and two spaces by the entrances; these can be reserved for disabled spaces on request. Reception is open from 7.00am to 11.00pm Monday to Friday, 8.00am to 11.00pm Saturday and Sunday. In an emergency telephone 07702510429 or 07720406464.The hotel does have a lift in the new building only. There is a ramp door way into the hotel, via the entrance to the rooms 1 to 10. There are 4 steps into reception via the front main entrance. There is a seating area by room 1 to 10, that connects the 2 buildings together and also in the main lounge, off reception and in the reception area. Males in the Hennessey bar, which is on the ground floor. Ladies on the first floor above reception, only accessible by one flight of stairs, and also by the reception desk on the right. Disabled toilets and baby changing facilities are situated on the ground floor by reception desk on the left hand side. You can access all of the above through the main entrance to reception or via the entrance between the two buildings to the room’s 1-10.All the tables and chairs in the public areas are moveable. The tables in the dining room/restaurant are all at the same height. The hotel can cater for special dietary requirements on request (notify on booking preferred) Waitress service is available in all areas. In house laundry service is available, ask at reception. If specialist cleaning or dry cleaning is required this will take slightly longer, please enquire at reception. There are three rooms available in the main hotel building, “The Guild Room” “The George Lewis Suite” and “The Waldron Suite” all on the ground floor. These rooms can seat a minimum of 10 guests to a maximum of 40 guests. All function rooms are accessible from reception, the main entrance and the entrance between the two buildings to the rooms 1-10. Rooms 7-14 are all on the first floor only accessed via reception or through the entrance between the two buildings (to room 1-10); this is suitable for minor disabilities only but does not have a wet room or disabled bathroom. All bedrooms and public areas have no hand rails available. Cats and dogs are allowed to stay in the hotel rooms, but must sleep in their own crate or bedding only there will be a small surcharge. Guide or hearing dogs only are allowed in all public dining areas. Dogs and cats must be kept on a lead at all times. All cat and dog excrement must be bagged and disposed of in the hotel’s wheelie bin, located behind the fenced area in the small paddock. The hotel and grounds are on many levels, because of this, some areas are unsuitable for wheel chair access; these are woodlands, “Laipui” bandstand, “Stenhouse Bridge” and surrounding areas. The outdoor swimming pool is accessed via the steps by the Hennessey bar terrace, or the slope on the left hand side of the hotel for pushchair’s and wheelchair access. All adults are responsible for themselves and their children around the outdoor swimming pool and pond, as the hotel does not have a life guard on duty. There are life buoys available in both areas. Grimscote Manor Hotel does not accept responsibility or liability, for loss or damage to belongings or property on their estate what so ever. Areas of our grounds are left in a semi natural state. This is part of our deliberate plan to encourage wildlife to share our grounds. There are no hand rails. Grimscote Manor accept no responsibility what so ever in the grounds or hotel. Dinner is by RESERVATION ONLY to none residents from 7.00pm to 9.00pm Sunday to Saturday and for residents from 7.00pm to 9.00pm Monday to Saturday, Dinner on Sunday evening only available from September to April. Please see the Information Pack available in each bedroom, or ask at Reception for details. Grimscote Manor has the policy to close on these weekends unless prior arrangement has been made in advance. Please note: These numbers are only available from a mobile or the public payphone in the hallway, by the GeorgeLewis Restaurant.